China Glaze Sun Glaze Solar Activated polishes are an older line from China Glaze that contained 24 color-changing shades. 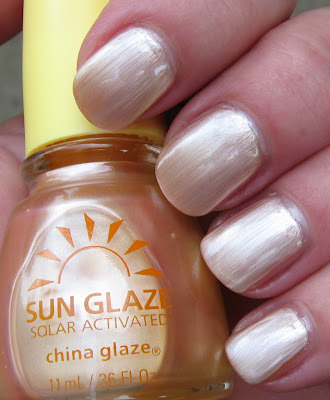 While these don't actually change color very much--perhaps due to their age--they are vintage and they are China Glaze, so I welcomed them into my collection when a very good friend gifted them to me. The formula is not as smooth as the China Glaze polishes of today, and they're a little streaky and on the frosty side. The bottle size is small at .36 fl. oz. 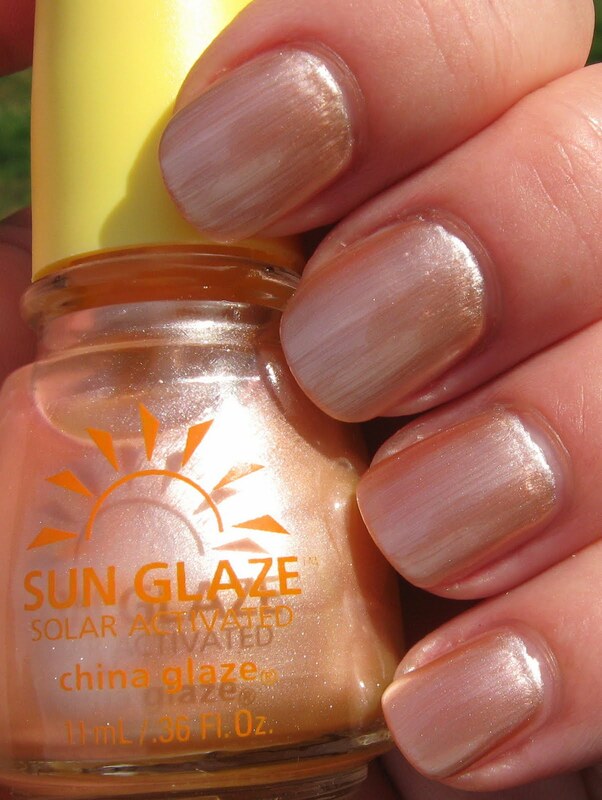 Above & Below: Pearl Orange to Rose is an golden apricot shimmer in the sun, then it changes slightly to a more gold color in the shade. I don't see any rose in there, do you? Below: Light Yellow to Plum is a pale pink with a hint of copper color in the sun (directly below), and a very pale lemon yellow in the shade (last photo). You can see what I mean about the formula being a little problematic, especially near my cuticles. 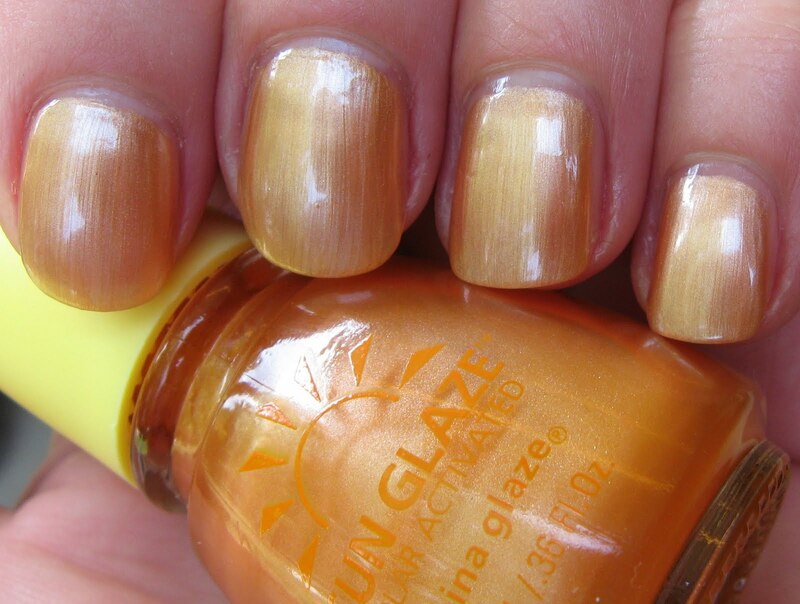 I'm guessing that in their glory days, the Sun Glaze polishes may have had a more dramatic color change than they do now, simply because of their age. I suppose it's possible for the active ingredient to become less active over time, but I don't really know. Have you ever seen or heard of these? If anyone knows when these came out, I'd be interested to hear any information about this line. Never knew of these! I bet when they were more "potent" the colors do change more. I have one of these! It's blue and I never realized that it was a color changing polish OR that it was by China Glaze! WOW! Thanks for the history!!! It was gifted to me so I have no idea when it came out! Wow, I'm seeing polishes I've never seen before. Not the greatest looking polishes. They're fun though.